4402 Windsor Court ~ Newly Updated 4th Floor Villa with Ocean Views! 4402 Windsor Court North is a spectacular 2 bedroom, 2 bath Oceanfront villa on Hilton Head. 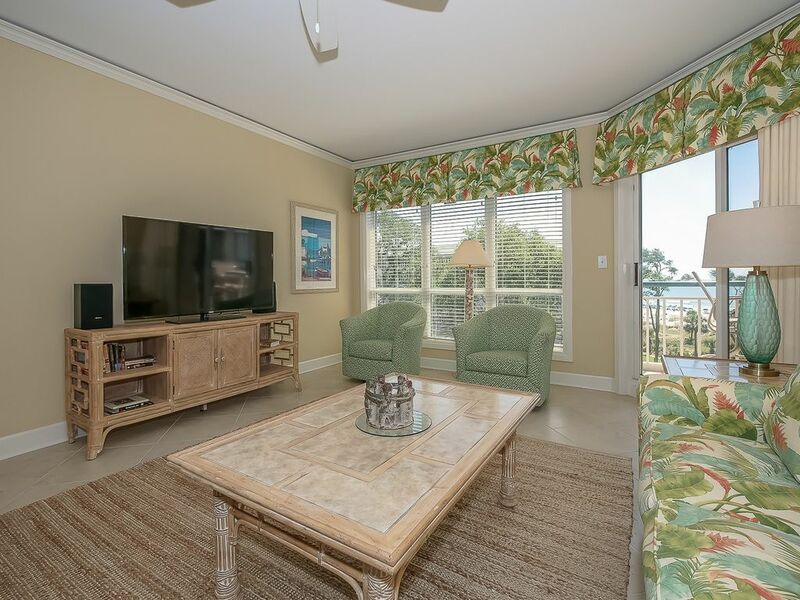 Located in the highly desirable Palmetto Dunes Plantation, this 4th floor vacation rental offers all the amenities you would expect in a premier vacation property. Recently redecorated, the villa offers beautiful furniture in the living room and granite top counters in the kitchen. A tiled entryway, kitchen, and dining area lead to new Berber carpet in both the living room and the bedrooms. A sleeper sofa is also available in the living room. Attractive ceiling fans in all rooms will keep you cool in the summer. The master bedroom features a king bed with a private bath with sunken Jacuzzi tub, separate glass shower, and double sinks. The guest bedroom offers 2 twin beds with a hall bath with a jetted tub/shower, and access to a private balcony. Both bedrooms offer views of the ocean. Be sure to bring your tennis racquets for a free hour of tennis daily. Guests can start their day with a morning cup of coffee on the living room balcony watching the sunrise and dolphins playing in the surf. There is a beautiful grass lawn with tall trees and lush tropical landscaping to the left, and the wide open ocean straight ahead. At the end of a fun-filled day, sip cold lemonade and take in a breath-taking sunset. Guests will delight in this luxury villa and all the attractions in Hilton Head, SC. Guests must provide their own beach and pool towels! Please call or send email inquiry for stays longer than one week. Online quotes do NOT calculate correctly for longer term rentals OR for stays that overlap two different rate periods. Monthly rentals are four full weeks, Saturday - Saturday.